What a voice. What a talent. My sister, Nurse Rachet, always said there was one man she'd leave her husband for at the drop of a hat. Fat Luther. Skinny Luther. Didn't matter. If he called, she'd come running. 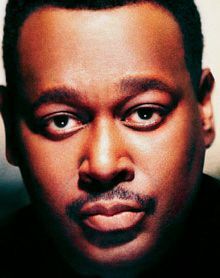 Luther Vandross died today at age 54, having never fully recovered from a stroke he suffered in 2003. The late, great Luther Vandross. If you have friends or family with hypertension and diabetes, support them, help them make healthy choices, and don't let them totally stress out. Luther was clearly a Type A personality, a driven performer, and, unfortunately, a yo-yo dieter, which may have damaged his health pretty seriously. Hope you're having a nice reunion with your father, Luther. You two can dance now as much as you want.